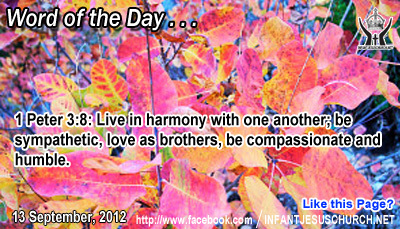 1 Peter 3:8: Live in harmony with one another; be sympathetic, love as brothers, be compassionate and humble. Heavenly Father, we confess that we have let our own over-sensitive self be wounded and have reacted with pettiness when our brothers and sisters in Christ have not treated us as we felt we deserved. We know Jesus was treated so rudely and shamefully by those he created and so we shouldn't be surprised when things don't always go well for us. Father, please help us to know when to challenge those who wound us with a loving confrontation and when to just ignore the insult and find a way to minister to them because of some deeper wound has crippled them in their life. In Jesus' name we pray. Amen..
What makes Christians dissimilar and what makes Christianity separate from any other religion is grace – treating others, not as they be worthy of, but as God wishes them to be treated – with loving-kindness and mercy. God is good to the undeserved as well as the just. His love embraces saint and sinner similar. God seeks our highest good and teaches us to seek the most good of others, even those who hate and abuse us. Our love for others, even those who are unappreciative and selfish towards us, must be marked by the same kindness and mercy which God has shown to us. It is easier to show kindness and mercy when we can anticipate to benefit from doing so. How much harder when we can anticipate nothing in return.